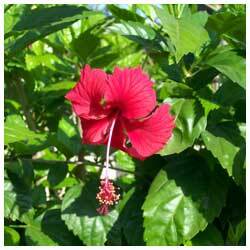 Description: It is a beautiful shrub that grows up to 3 m tall. Leaves are broadly egg-shaped and are toothed along margins. The plant bears long-stalked, large, showy, red or white flowers. The plant bears flowers almost through the year and is widely cultivated in gardens and households as an ornamental plant. How to Grow: t is recommended to grow two plants - one each with red and white flowers - in home herbal garden. These can be planted either directly in the ground or in pots of size of 25 to 30 cms. Care regime: When planted in ground, watering twice a week is adequate. However, plants in the pots require more frequent watering. Collection: Fresh flowers can be collected in the morning by plucking.